Last night we saw the new Kon-Tiki movie at our local cinema. A full-fledged action/adventure film it relates the story of Thor Heyerdahl and his 1947 Kon-Tiki expedition. It is the most expensive film ever to have been made in Norway and was a nominee for Best Foreign Film at this year’s Oscars (which it did not win). The film is directed by Joachim Rønning and Espen Sandberg and the role of Thor Heyerdahl is played by Pål Sverre Valheim Hagen. I enjoyed every minute of this 2 hour movie. Stunning visuals and a clear demonstration, I think , that understatement is far more effective than “sound and fury” in sustaining excitement. It took me back some 50 years to 1962 when I first saw Heyerdahl’s own documentary movie about his expedition (which did win an Oscar in 1951). Ever since then I have eagerly followed Heyerdahl’s various expeditions and theories of the migrations of ancient peoples (Ra and Tigris and The Search for Odin among others). And my current fascination with anthropology is in no small measure due to Heyerdahl’s injection of adventure and wonder and a kind of “romance” into the long-dead past of our ancestors. It does not matter that his theories were heavily criticised and may not have been correct. It does not matter either that our theories about the past may no longer be capable of being “proven” conclusively. Imagining how our ancestors – just 100 or so generations ago – could have behaved and acted is what I find absolutely compelling. And Heyerdahl’s adherence to the materials and tools of the past adds credibility at least to imagining what our fore-fathers could have accomplished – if not necessarily to his own theories. Back in 1962 when I first saw Heyerdahl’s documentary I had not fully appreciated the enormity of what Heyerdahl and his “glad amateurs” were trying to do. While he had an absolute belief in the migration of people from South America to Polynesia, his companions were only there either because he was or because they were seeking some intense adventure after the war. 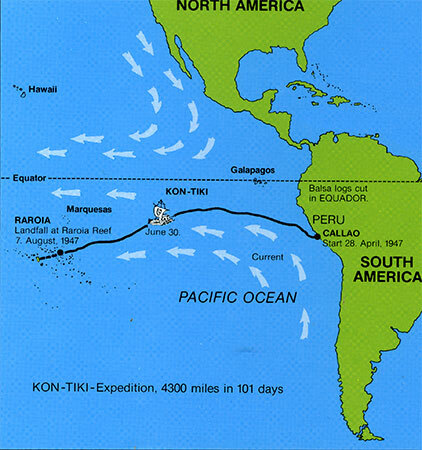 While the success of the Kon-Tiki could not prove that this migration had actually taken place it certainly proved that it could have. Heyerdahl’s theory received much criticism from the establishment view that Polynesia had been populated solely from Asia. But what all this “establishment criticism” sometimes forgets is their sense of wonder and that Heyerdahl does actually prove that it could have happened. This criticism continued well into the 1990’s but the latest genetic studies now show that Heyerdahl was in fact partly correct. But that is changing as advanced genetic studies show that there is some clear admixture from South America. Now – 64 years later- new research has finally proved the adventurer was at least partly right after all. A team of scientists have tested the genetic make up of descendants of the original islanders and found it includes DNA that could have only come from native Americans. That means that some time before the remote islands – including Easter Island – were colonised by Europeans the locals had interbred with people from South America. …. The established theory has always been that Polynesia was colonised via Asia around 5,500 years ago. This has been backed up by archaeology, linguistics and some genetic studies. But in 1947, Heyerdahl controversially claimed that Easter Island’s famous statues were similar to those at Lake Titicaca in Bolivia, and sailed a raft from Peru to French Polynesia to prove it could have been colonised from America. Now Professor Erik Thorsby of the University of Oslo in Norway has found clear evidence to support elements of Heyerdahl’s hypothesis. Abstract: It is now generally accepted that Polynesia was first settled by peoples from southeast Asia. An alternative that eastern parts of Polynesia were first inhabited by Amerindians has found little support. There are, however, many indications of a ‘prehistoric’ (i.e. before Polynesia was discovered by Europeans) contact between Polynesia and the Americas, but genetic evidence of a prehistoric Amerindian contribution to the Polynesian gene pool has been lacking. We recently carried out genomic HLA (human leucocyte antigen) typing as well as typing for mitochondrial DNA (mtDNA) and Y chromosome markers of blood samples collected in 1971 and 2008 from reputedly non-admixed Easter Islanders. All individuals carried HLA alleles and mtDNA types previously found in Polynesia, and most of the males carried Y chromosome markers of Polynesian origin (a few had European Y chromosome markers), further supporting an initial Polynesian population on Easter Island. The HLA investigations revealed, however, that some individuals also carried HLA alleles which have previously almost only been found in Amerindians. We could trace the introduction of these Amerindian alleles to before the Peruvian slave trades, i.e. before the 1860s, and provide suggestive evidence that they were introduced already in prehistoric time. Our results demonstrate an early Amerindian contribution to the Polynesian gene pool on Easter Island, and illustrate the usefulness of typing for immunogenetic markers such as HLA to complement mtDNA and Y chromosome analyses in anthropological investigations. This entry was posted on April 6, 2013 at 8:40 am and is filed under Anthropology, Behaviour, Norway, Science. You can follow any responses to this entry through the RSS 2.0 feed. Both comments and pings are currently closed.